Every other month, IDC surveys Chief Learning Officer magazine’s Business Intelligence Board (BIB) on a variety of topics to measure the attitudes, issues and interests of senior training executives. This month’s topic is outlook on training, and this article will discuss the survey responses of 238 BIB members as well as compare the results to similar survey data from past years. 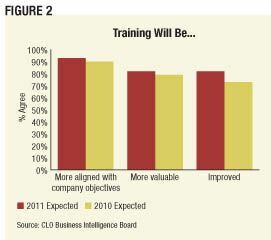 More CLOs expect training to be more aligned with company business objectives. More CLOs believe the perception of training within their company will increase. More CLOs believe the quality of their training offerings will improve. 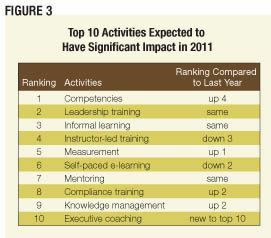 The ranking of activities’ impact in 2010 shows movement, though leadership training and competencies remain at the top. Instructor-led training — including classroom and virtual classroom instruction — has become the most impactful training activity. Informal learning remains near the top, and self-paced e-learning has moved up. Three items that were on the list last year but are no longer in the top 10 include performance management systems and live e-learning. These could be lurking below the surface with many CLOs, but their popularity clearly has waned. When asked about the “most important” activity, CLOs listed competencies above leadership and various delivery methods. This is an interesting change; competency had been rated as most significant before the economic crisis, which may have boosted appreciation for its value. Competencies: Competencies are valuable because they “help define a foundation for future development activities” and are “a good linkage between business goals and training.” Formally, competency models form the foundation to develop job descriptions, recruiting criteria, performance objectives and the associated curriculum and training materials. “The company’s philosphy is to hire, train [and] reward the best we can find. That starts with getting the right people on the bus. But getting the right people also requires a thorough understanding of the competencies, skills and abilities of candidates. We believe that an enterprisewide focus on competencies not only drives recruiting, but extends to on-boarding and training of new staff.” Tailoring on-boarding programs to a new employee’s competencies is a sophisticated approach to achieve rapid productivity. CLOs think informal learning deserves more attention in 2011, as they have for the past two years. At the same time, social networking is both lauded and condemned for its popularity. Much about this upcoming year is uncertain, and many CLOs see 2011 as “another challenging year.” Challenges from hiring to retirements and job changers will increase the importance of the training function, specifically greater emphasis for online, asynchronous training and more informal learning assets in lieu of formal training. Overall, companies believe the outlook for the learning function is similar to industries overall — it will be difficult, but there will be positive developments in the way organizations leverage and align learning, use tools and refocus on providing value to the organization. Cushing Anderson is the program director of learning services at IDC. He can be reached ateditor@clomedia.com.